A visit to Krasnaya Polyana without dinner at Restaurant Pats’ha Achishcho would be like a visit to Sochi without seeing the sea and the mountains. 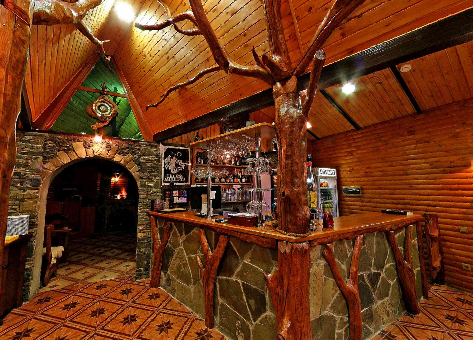 Restaurant with national traditions, the history of the Caucasus and the Cossacks. And known Caucasian hospitality, which is legendary among Russian citizens. Have a dinner in the place with crystal-clear air, and a view at unique scenery of snow-capped peaks and mountain river Beshenka. 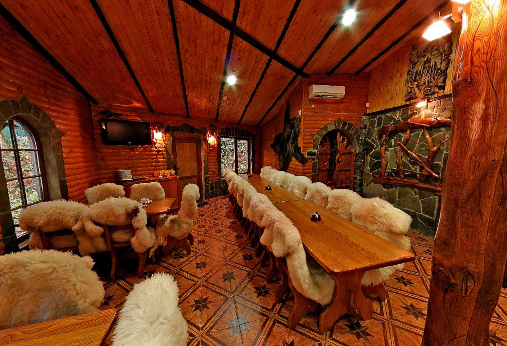 Restaurant Pats’ha Achishcho (Caucasian cuisine) consists of 4 rooms total of 90 seats. During the summer gazebo in a mountain stream. Pride of our restaurants – spring water, which is used to cook a meal. Also at the territory it has two pools with flowing spring water in which swim Russian-Siberian sturgeon and rainbow trout. You can order that fish for dinner, or look at chicken yard, where you can choose your favorite chicken, duck, goose or ask to fry just-collected eggs. Restaurant is pleased to introduce guests to fresh meat from own farm. Most of the dishes prepared from selected beef, pork, lamb elite varieties. The tea is hand-collected from 12 different kinds of herbs which grows in a local area, honey supplied to tea – with its own apiary. Also bread is baken there. There is a playground, captive complex with decorative bird. In the courtyard of the restaurant a lot of parking spaces under the air.